HeartWorm Free (aka HWF) will kill heartworms slowly over a period of time allowing your dog's immune system to help eliminate the heartworms from its body. Because HeartWorm Free works slowly your dog does not need to be confined. Killing heartworms can be dangerous. Dead worms can clog small blood vessels causing organs to fail making it imperative that your dog be confined to a small space to try and prevent this from happening. Older or sick dogs may not be able to tolerate traditional vet treatment and some dogs are simply sent home to die without treatment, as the traditional heartworm treatment would kill the dog. This is why HeartWorm Free was created. Select proper dosage of HWF. Give orally 2x/day. How many 4 oz. 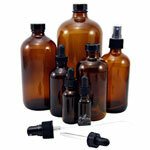 bottles of HeartWorm Free will you need? This chart may be used as a guide only. It is not a guarantee. Weigh your dog before starting HWF. How long will you need to use HWF? If your dog has no symptoms - 16 wks. Symptomatic dog tires easily, loss of appetite, cough - 24 wks. Symptomatic more than 3 mos. - 26 wks. Symptomatic more than 6 mos. - 36 wks. Every dog is different and some will respond more readily than others. HWF is safe to use in pregnant dogs at half the normal dose. Give normal dose AFTER she whelps. HWF contains: Garlic, black seed, licorice, hawthorn, hops, sorrel, apricot pits, grapefruit seed extract, steak flavoring, alcohol, & filtered water. It is now advised to do a 30-day course of Vibactra Plus BEFORE starting the HWF product. 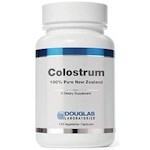 This will help with the Wolbachia Bacteria required for heartworms to reproduce. For more information on HWF, please Click Here . WARNING: Keep out of reach of children. Apricot pits contain small amounts of naturally occurring cyanide. Do NOT give to cats. DO NOT use with chemical flea & tick or heartworm products. Watch for allergic symptoms such as hives, trouble swallowing and swelling around the eyes. If one is experiencing any adverse symptoms or notes any adverse signs, cease using this product & immediately contact your nearest emergency medical system. Puppies eight weeks or less don�t produce new red blood cells so never give them garlic. Since garlic affects blood clotting don�t use it two weeks before or after any scheduled surgery. 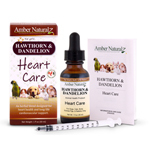 Here are some natural products that may be of interest to those with heartworm positive dogs. 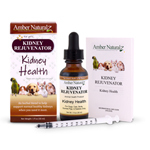 IF your dog is exhibiting symptoms of heartworm, it is best to use the Kidney Rejuvenator and Hawthorn & Dandelion for optimum heart and kidney support and strengthening with the HWF. If coughing is severe, we recommend HWF, Kidney Rejuvenator, and Hawthorn & Dandelion. Adizone. 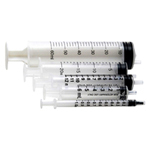 Life Cell Support should be used 3x/day for 30 to 60 days AFTER your dog tests negative for heartworm.